I’ll admit that making your own pasta is a bit time consuming. 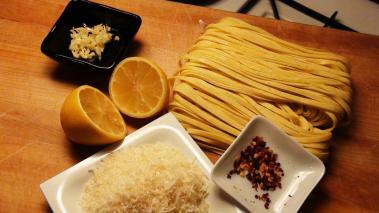 But, I’ll also contend that homemade pasta is one of the best things you can make at home. While it does take some time, it’s not super hard, and there is a high level of satisfaction you’ll get from making your own. And it’s sooo tasty. In this recipe video, I show you how to make a homemade fettucini pasta – one of my favorite shapes. The fettucini noodle is broad enough to hold a sauce well, and once you have dough rolled out, it’s easy to cut. Let’s go ahead and get started. Again, heavily flour them to prevent from sticking. You can use them right away or they freeze really well. There is a ton of great fettucini dishes you can make with this pasta. I’ve got several on the site, and am adding more every week. So you hope you make some fettucini soon, and leave a comment to let me know how it goes. Everything composed was actually very logical. But, what about this? what if you were to write a killer title? I mean, I don't want to tell you how to run your blog, but what if you added something that grabbed folk's attention? I mean Add new comment | Recipes & Recipe Videos, How to Cook Videos & Cooking Techniques | No Recipe Required is kinda vanilla. You ought to peek at Yahoo's home page and note how they create post titles to get viewers to open the links. You might add a video or a related picture or two to get readers interested about everything've got to say. In my opinion, it could bring your website a little bit more interesting. When Meredith Perry started studying astrobiology at the University of Pennsylvania, her career goal was to eventually find life on other planets. Instead, Ms. Perry accidentally stumbled upon something even more exciting: the ability to charge portable electronics, like cellphones and laptops, wirelessly using ultrasound. Qi has entered mainstream consumer adoption and quickly solidified its position as market leader. With new Qi installations in airports, public venues, office buildings, restaurants, hotels and cars, the installed base of Qi-enabled wireless charging spots has increased to more than 30 countries and one million locations. To further increase the awareness and knowledge for wireless power, element14 (Farnell) started a collaboration with Texas Instruments and Würth Elektronik aptly named Beyond the Phone Challenge, which is their second design competition utilizing Wireless Power.